TSPSC Music Teachers Recruitment Syllabus, Exam Pattern/ Scheme of Examination. TSPSC TS Residential Music TeachersRecruitment Syllabus, Exam Pattern/Scheme of Examination, TSPSC Music TeachersSyllabus, Exam Pattern, TSPSC Music Teachers recruitment syllabus,exam pattern, TSPC Gurukulams Music Teachers recruitment syllabus,exam pattern; Scheme and Syllabus for the post of PETs in Residential Educational Institution Societies; Preliminary (Screening Test) Scheme and Syllabus, Main Examination Scheme and Syllabus for the post of Music Teachers. 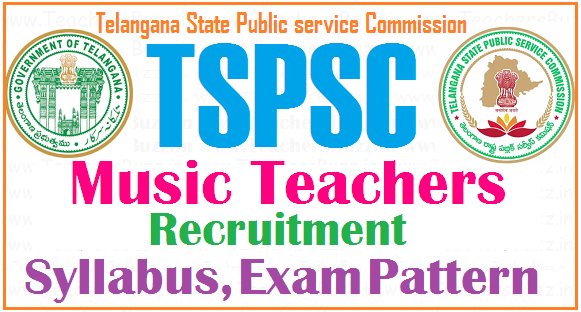 TSPSC TS Social welfare Gurukulam Music Teachers Posts Recruitment examination pattern, TSREIS(School Education), TSWREIS (Social Welfare), MJP TSBCWREIS (BC Welfare), TSTWREIS(Tribal Welfare), TSMWREIS (Minority Welfare) Music Teacher Posts Recruitment Scheme of exam. TS REIS's Music Teachers Recruitment syllabus, exam scheme; tspsc tswreis, mjp bcwreis, tstwreis,tmreis Music Teachers recruitment syllabus, exam scheme details are given here. Notification➧TSPSC Gurukulam Teaching, Non Teaching Posts Recruitment Notification 2017 Online Applications. 1. Current Affairs – Regional, National & International. 2. Indian Constitution; Indian Political System; Governance and Public Policy. 3. Social Exclusion; Rights issues such as Gender, Caste, Tribe, Disability etc., and inclusive policies. 6. Environmental Issues; Disaster Management- Prevention and Mitigation Strategies and Sustainable Development. 7. Economic and Social Development of India and Telangana. 8. Socio-economic, Political and Cultural History of Telangana with special emphasis on Telangana Statehood Movement and formation of Telangana state. 9. Analytical Abilities: Logical Reasoning and Data Interpretation. 10. Moral Values and Professional Ethics in Education. 1) Musical Prosody; 2) Contemporary Music; 3) Teaching of Music in Schools. 1. TSPSC Gurukulam TGT Recruitment 2017 Notification, Apply online.